How many turns should I wind my Torsion spring? 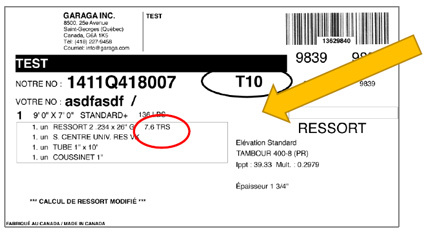 You will find this information on the label affixed to the torsion spring system. Also, look back at our residential installation manual for more information. Keep this label in your files or staple it to the wall near your spring system. If breakage occurs, you can give us this information to produce a replacement spring quickly. To help you make an "enlightened" choice when purchasing your new garage door, contact us! What’s more, we can provide you with a free quotation. If you experience problems during the installation of your garage door, contact us. We will see with you what you must do so that everything works perfectly. We also carry the full line of LiftMaster electric garage door openers and their accessories to meet all your everyday needs. To view all our Garaga window models, simply use our Design Centre. This way you can create your next dream garage door!